We are watching as a criminal empire attempts to artificially insert their dictator into power and this is a historic opportunity for humanity to see every step of the way how they are doing it. So let's not miss out on this unique opportunity made possible due to modern day technology and the advent of the internet. Day 2 of the Democratic National Convention in Philadelphia, PA promises to deliver classic Edward Bernays style propaganda to manipulate the opinion and views of the masses. It is now reported that the Democratic party is desperate to calm things down in the aftermath of the stolen primaries and the Bernie Sanders full-on sell out and they need to have their sheep unanimously support CFR criminal Hillary Clinton. But how can they do this? This is the question officials at the DNC are strategizing and brainstorming about and apparently they feel they have the possible tactics ready. One thing everyone should know about propaganda and lies and even Edward Bernays considered the founding father of modern day propaganda (later re-named "public relations") is that once the person subjected to the propaganda is aware of the propaganda the propaganda is no longer guaranteed to be effective. So there you are. Awareness alone can destroy this real-time attempt by those behind the Democratic National Convention whose only purpose is to insert lifetime criminal Hillary Clinton into the position of presidency of the United States so that the ruling elite can finally have their fully operational one world government at the expense of millions of lost lives. So let's do everything we can to continue to spread this awareness. Before we discuss the rumored DNC strategy for inserting CFR criminal Hillary Clinton as the "official" nominee of the party for presidency let us realize that the one unanimous purpose for all of these strategies is to get the attention away from Hillary's crimes, lies, deceit and misdeeds. However they need to do it. Be on the lookout for the following strategies being discussed by the those manipulating the event. Hillary Clinton’s campaign is in talks with Bernie Sanders about giving the Vermont senator a larger role at the Democratic National Convention Tuesday night in a bid to heal rifts in the party, as her team seeks to reintroduce her to voters still deeply skeptical of her candidacy. This is a pathetic attempt to make you think that Hillary is the same as Bernie. They want to somehow convey to the crowd the delusion that the actual issues don't matter but the party does! This is the greatest lie any Sanders supporter could ever fall for. Nothing could be further from the truth and I urge Bernie Sanders supporters to stop what you are doing and think on your own. The party itself has nothing to do with anything. As the years and decades go by anyone can see that there is no difference between the 2 party system and they are 2 parties controlled by the exact same ruling elite. 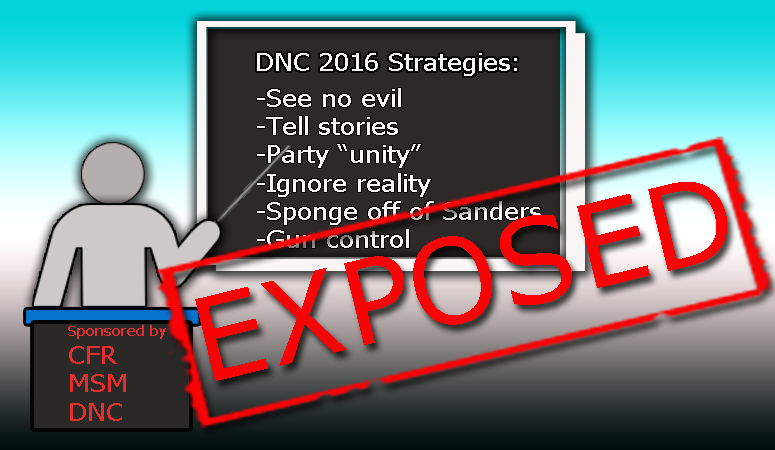 As mentioned, hidden in this strategy is a plan by the Democrats at the DNC to sell "unity". Expect the whole kumbaya peace and love psyop Tuesday and the rest of the week as "unity" is one of the few cards the ruling elite can play in a desperate attempt to make people forget that Hillary is a criminal who belongs in jail. We can expect more Hollywood celebrities and musicians to grace the stage with their opinions. Again, all of this is like reading right out of a Bernays marketing strategy campaign and all we need to do is realize it's all fake and everyone is lying to you. Do not believe their lies. So when they role out Sanders on Tuesday (or any day during the convention) do not be fooled by this tactic. This is as old and corny a tactic a there is but this is exactly what the Democrats are planning. Roll people out who will tell compelling "stories" that will grab at people's emotions. They are not even hiding their strategy of manipulating people's emotions. Strategy number 3- Sell gun control by having key related speakers tell their "story"
A third strategy brewing for some time at the Democratic camp is to stir up and revive the "gun control" agenda. It seems they will start by featuring several family members of several famous race-related police killings in order to feed the ongoing engineered race war. You would think this would be a great time to address the American police state, the 1033 program, SWAT home invasions and police corruption right? Instead look for this to become a presentation for gun control and look for these family members to deliver classic emotionally engaging and compelling stories to trick everyone into supporting gun control. If this were not the case the individuals invited to speak would not be speaking. I can't say enough about the entire gun control agenda at work for years under the Obama regime which has watched mass shootings go up by 700%, many of them completely staged and orchestrated in one way or another by the federal government in order to create the circumstances to take away your guns. The "circumstances" to take away your legal Constitutionally protected guns will be explored very deeply in this convention. When it's all said and done realize that Hillary must go to prison orange jumpsuit and all. She is as much a criminal as it gets. She belongs in a prison doing hard time for the long list of crimes she is suspect of and in many cases crimes that are now confirmed by FBI's own director. Criminals that the majority of people don't trust don't get to be president because a propaganda mechanism says so. Let's once and for all tell this control mechanism, their media and the ruling elite who tell them what to say that we've had enough.